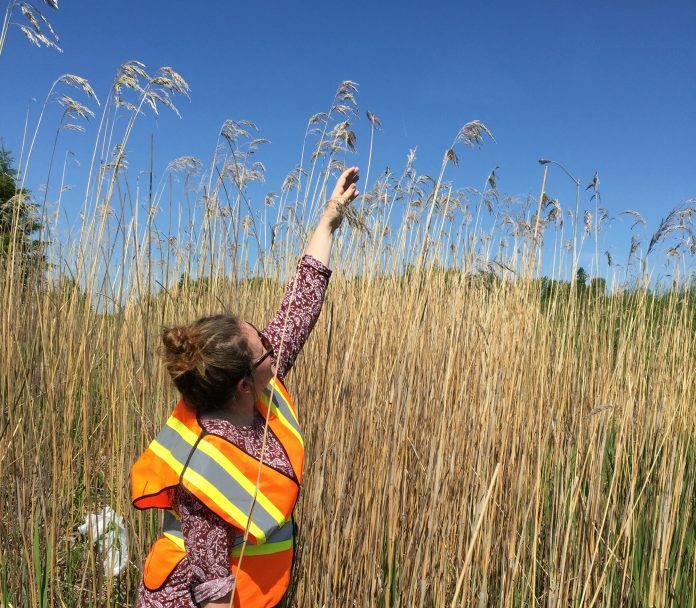 The Invasive Species Centre has enlisted the help of the Ministry of Natural Resources and Forestry (MNRF) Stewardship Youth Rangers to help control invasive phragmites along Highway 17. Phragmites australis or European Common Reed, is an aggressive invasive plant that wreaks havoc on Ontario’s wetland biodiversity and is listed as a restricted species under the Ontario Invasive Species Act. The stalks of the European Common Reed grow so thick that native vegetation cannot compete, and native animals (i.e. turtles) cannot climb through the dense mat of stems, blocking access to wetlands. The plant also creates a fire hazard as the dead stock is extremely flammable. Highway 17 is particularly vulnerable to the spread of this invasive plant due to the high traffic of motorists unknowingly moving hitchhiking seeds to new areas.